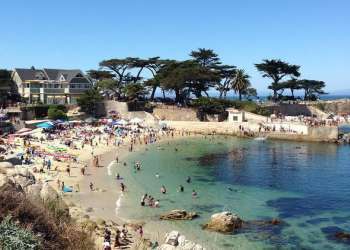 Pacific Grove&apos;s attractions evoke a timeless air, from its historic establishments to its breathtaking slices of nature. The Pacific Grove Museum of Natural History gives children and adults insight into the ever-evolving story of the Monterey Peninsula, with both human artifacts and exhibits on the flora and fauna of the area. Visitors can also learn what life was like when Pacific Grove was remote and wild by visiting the Point Pinos Lighthouse, the oldest continually operating lighthouse on the West Coast and the oldest building in Pacific Grove. Ranked as one of America&apos;s best golf courses by the Zagat Survey, Pacific Grove Municipal Golf Links offers great play, low greens fees and sweeping views of Monterey Bay. Both wheelchair accessible Asilomar State Beach and Lovers Point Beach offer reliable surfing and beautiful kayaking. Cyclists and pedestrians enjoy the coastal views along the Monterey Bay Coastal Recreation Trail. If you&apos;re fortunate enough to be in Pacific Grove during the fall or winter, you will be witness to one of nature&apos;s most incredible spectacles: the annual migration of the Monarch butterflies. Tens of thousands of Monarchs descend on Pacific Grove in October, and take up residence in the pines and eucalyptus trees of the Monarch Grove Butterfly Sanctuary.